The Bennington Museum’s Milton Avery’s Vermont is as close to a perfect show as mere mortals can mount, small in scale, with beautiful objects, expertly interpreted, and with many surprises. Every art lover needs to learn more about this work and the museum itself. Milton Avery’s Vermont, a terrific show at the Bennington Museum in Vermont, draws us into this great American artist’s singular color world. At the same time, it tethers us tightly to where we are: Vermont. The exhibition brings together, for the first time, dozens of the paintings, watercolors, and drawings Avery made on family visits to the West River Valley region of Vermont between 1935 and 1943. 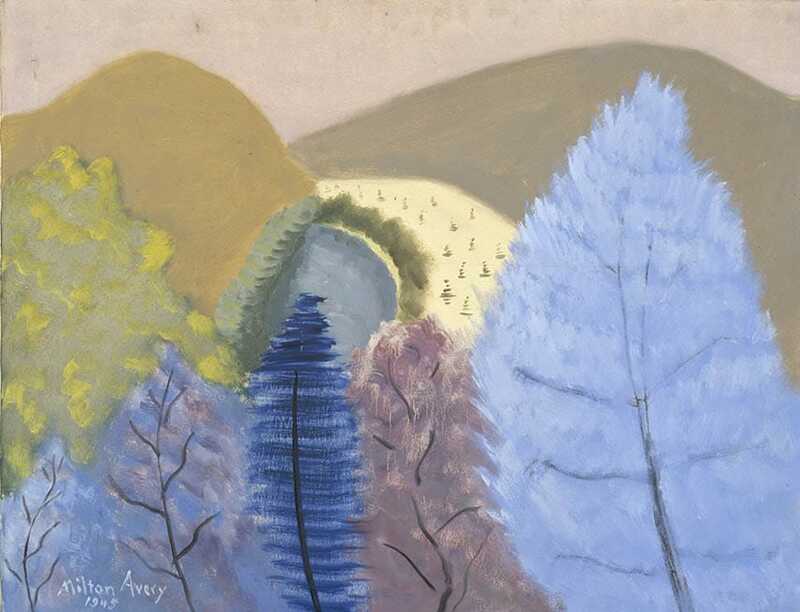 Milton Avery’s Vermont takes the first focused look at the work this great American modernist created based on his summers spent in Southern Vermont between 1935 and 1943. The exhibition examines Avery’s artistic process, featuring pencil sketches executed en plein air, wonderfully fresh watercolors that were based on his sketches, and many of his major oil paintings that were drawn from these sources and typically completed during the winter months in his New York studio. Avery’s Vermont works provide insight into the trajectory of his stylistic development during the fertile decade leading up to what are perhaps his best-known works, created after he joined Paul Rosenberg’s gallery in 1943. The works in the exhibition are drawn from Milton Avery Trust and The Milton and Sally Avery Arts Foundation; National Gallery of Art, Washington, D.C.; Neuberger Museum of Art, Purchase College, State University of New York; the Peabody College Collection, Vanderbilt University Fine Arts Gallery; as well as important public and private collections. A beautifully illustrated 80-page catalogue with essays by Karen Wilkin and Jamie Franklin will accompany this exhibition and be available mid-June. This exhibition is generously supported by The Milton and Sally Avery Arts Foundation, Emily Mason and Wolf Kahn, and Pat Adams and Arnold Ricks. This is the first exhibition to take a focused look at the work this great American modernist created based upon his summers spent in southern Vermont, from the mid-1930s through the mid-1940s. By any account Rawsonville and Jamaica, Vermont, are out-of-the way villages, tucked into the picturesque Green Mountains, surrounded by rolling mountains, green forests, and babbling brooks. Avery, who regularly spent his summers traveling with his family in search of new material for his art, was undoubtedly drawn to Vermont by his friend Meyer Schapiro, one of the most important art historians of the twentieth century, who had owned a summer home in Rawsonville since 1930. Noted for his simultaneous commitment to exploring the formal, abstract qualities of art (line, texture, composition and, especially color) and the creation of representational images drawn from his daily encounters with people and places, Avery’s Vermont work vividly captures his family’s summer activities, and sketching both family members and the artist’s personal response to the Vermont landscape.